When we inherit property that has a value to it, especially property that increases in value, we often don’t take into account the tax consequences. Capital gains taxes can take a large chunk out of property that you have inherited and you later try to sell if that property has increased in value. Capital gains taxes are taxes on the increased value of property that you inherit. In many cases the capital gains tax on inherited property won’t be significant. But what about assets that do have value or large increases in value? You may not think that anybody in your family has anything of great value or appreciation to pass on. But items that may have been purchased by our parents or grandparents throughout their lives may have had a lot of time to appreciate in value. Items that appreciate may include stocks and shares in companies, as well as physical items including real estate. Let’s pretend that your grandfather had purchased the first Apple computer ever made. Back then, the computer cost about $600. Recently an Apple 1 sold at an auction house for over $200,000. If that was your computer that sold, there would be an incredible capital gains tax assessed on that increase. At the typical 15-23% capital gains tax, that’s about $15,000 to $45,000 in taxes. But what if you could change the starting date that’s used to determine what that asset was worth? What if, instead of the beginning value being when your relative purchased it, the starting point could be the day you inherited it, and the ending value the day you sell it? In most cases, this would drastically reduce the capital gains taxes. In our example, if that computer was worth $200,000 when you inherited it, and you sold it 5 years later for $205,000, the capital gains tax would only apply to the $5,000 increase. The start date has “moved up” from when your relatives bought it to when you inherited it. Many people miss out on the value of this step up in basis because they gift items to relatives before they pass away. Giving away property may seem like a nice thing to do but the ability to change the date of valuation only applies to inherited property. That gift could end up costing your relative a lot of money in taxes. Putting assets in a revocable trust may create issues with changing the basis date. As we have discussed previously in this blog, revocable trusts don’t provide asset protection from creditors. Irrevocable trusts are best for that purpose. 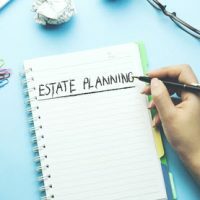 But property that is in an irrevocable trust and passed to a relative as an inheritance may not qualify for the step up basis. You can get the benefit of the basis change even if you were part owner of property with the deceased and inherited all of it afterward, but the benefit would only apply to the part you inherited. Make sure the property you leave to relatives doesn’t end up creating tax burdens. Contact Tampa estate and business attorney David Toback to discuss a comprehensive asset protection plan.